Touro Law Center, New York, J.D. 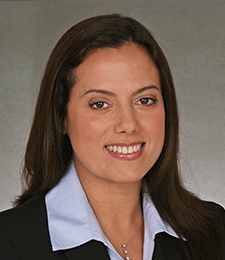 Dana M. Koos is partner with Goldberg, Miller & Rubin, P.C., managing our New York City office since 2013. Dana oversees the daily operations of all New York litigation for the firm and counsels associates in the defense of automotive negligence and other personal injury matters. Her expertise in third-party and first-party no-fault litigation has been a contributing factor in her victories in countless arbitrations and at trial. Throughout her career, Dana has spent countless hours in courtrooms in all five boroughs of New York, along with Nassau, Suffolk, Rockland, and Westchester counties. Dana is recognized as a leading practitioner, litigator, and highly-skilled negotiator in insurance defense. Dana has a knack for understanding the incentives and desires of all sides in a case and is quickly able to assess matters and provide thorough guidance to clients regarding case handling strategies. Dana takes pride in her analytical and fact-finding skills and uses them as a resource in the discovery phases of her cases. She has achieved favorable results in dismissal and/or discontinuances of cases prior to discovery end dates through her fact-finding abilities. Prior to joining GMR, Dana worked in-house for an insurance carrier where she was the designated liaison between the legal department and the investigation unit. In that role, she garnered exceptional knowledge in examinations under oath of claimants and New York State regulation compliance. Her practice also involved representing insurance carriers with a focus on fraudulent incorporation, staged losses, and no fault reimbursement. Dana takes pride in working closely with her clients and developing trusting relationships. Dana works with her clients to deliver incomparable advice on an array of litigation issues; she is recognized as a trusted advisor through her solid client relationships and commitment to providing the finest counsel. Dana is passionate about theater and music, which she studied as an undergrad. Working as hard as she does in our Manhattan office, Dana enjoys spending her free time going to Broadway shows and practicing as a vocalist. Dismissal of two of three plaintiffs for failure to provide discovery in timely fashion; all claims dismissed with prejudice. Plaintiff’s discontinuance of case with prejudice after counsel’s exploration of discovery matters revealed prior duplicative injuries, workers compensation fraud, along with dishonest pleadings. Multiple voluntary discontinuances after discovery led to ability to prove fraud. Dismissal of case on the grounds that the statute of limitations had run.